For all the other poker players out there. If you don't understand this one, then I apologize, but the good news is that I discovered the magic trick that makes lines super smooth without having to make the comic huge. Yay good quality! @ sarge: Thanks! I was so happy when I figured out the line thing because it's been bothering me for a while now. @ thornsinourside: ya ya, he wouldn't have had to show his hand, but that guy is like me, if everyone folds, then I HAVE to know what the winner had. And Jimmy isn't exactly the brightest one. Of course, the moment you stay in, they have something that will beat out everyone. Jimmy is just playing stupid, he's got the master technique down. It's not them I hate... That's a perfectly good bluff... What -I- hate is when I have a flush and they go all in with nothing. I, of course, call them on it thinking I'm going to clean up because I beat every hand out there... Then the next 2 cards pop up and they end up with a full house of 2s and 7s, or a four of a kind on 2s. When you bluff, you're not magically supposed to get the exact, .000001% chance card that you need TWICE to beat me. Bah. 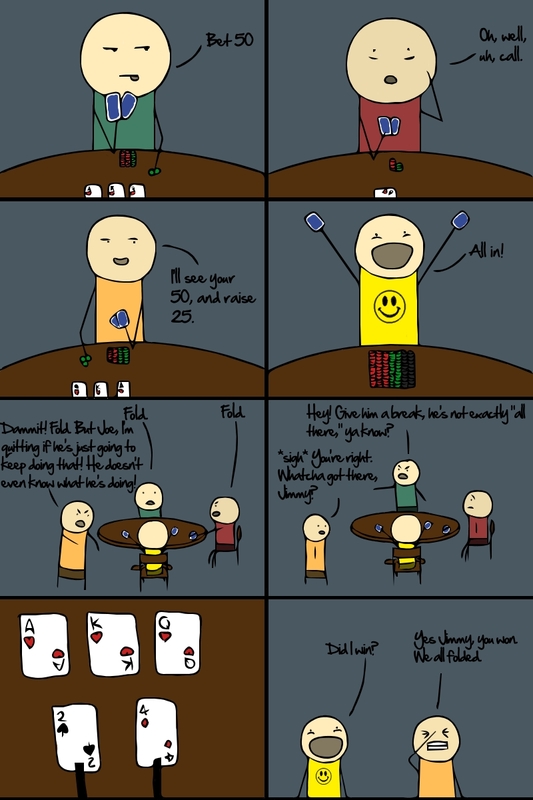 That's why I don't gamble in real life. Crap like that would get me 25 - Life.